Early this spring I hosted a wedding luncheon/shower at our home. The guest of honor is a huge fan of pink and green (my kind of gal! 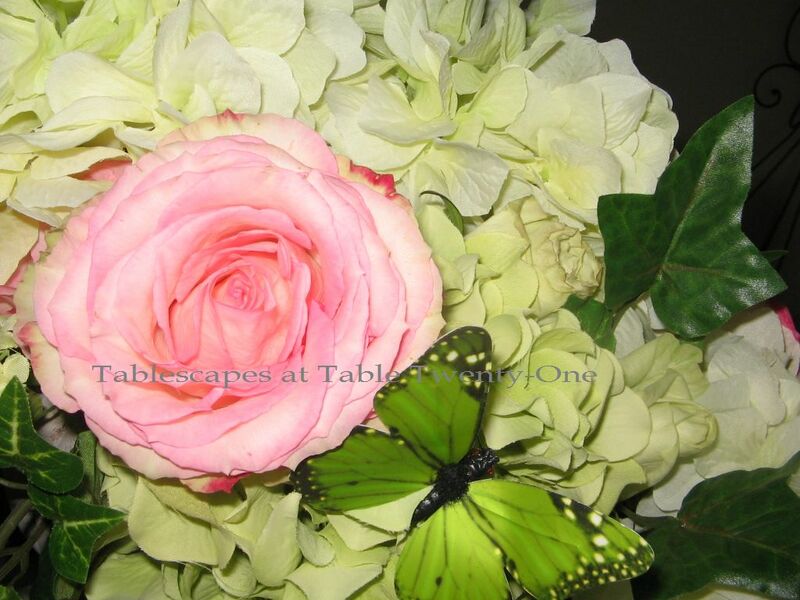 ), so a pink and green spring tablescape it had to be! These photos were taken before the rental company arrived with the white chiavari chairs that really helped to further feminize the overall look. I wish I could have gotten a photo with the chairs around the table! “Chelsea” collection crystal stemware by Godinger. International Silver “Danish Princess” flatware. 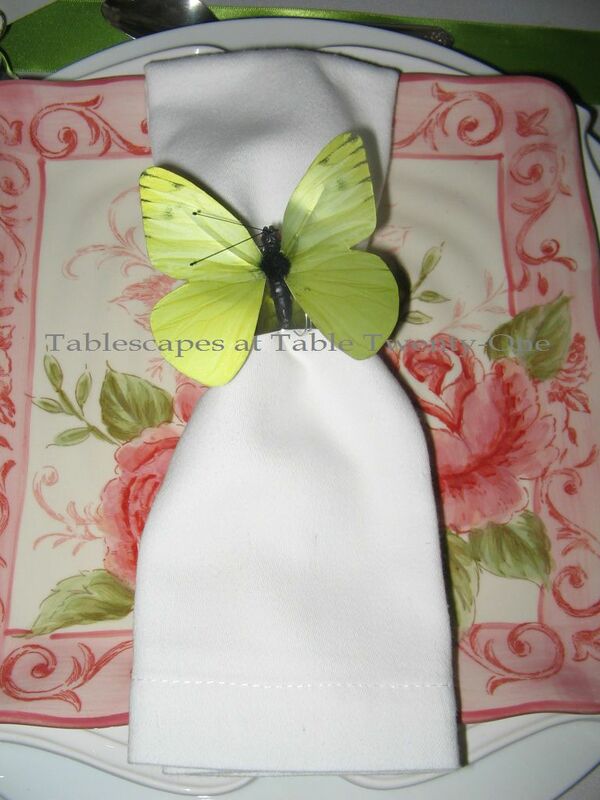 The starched white cotton napkin is tucked into a silver napkin ring adorned with a pale green butterfly. Decorating with butterflies is so much fun in spring and summer! The place cards are tiny silver wedding bells used in a tribute to the bride-to-be after lunch. 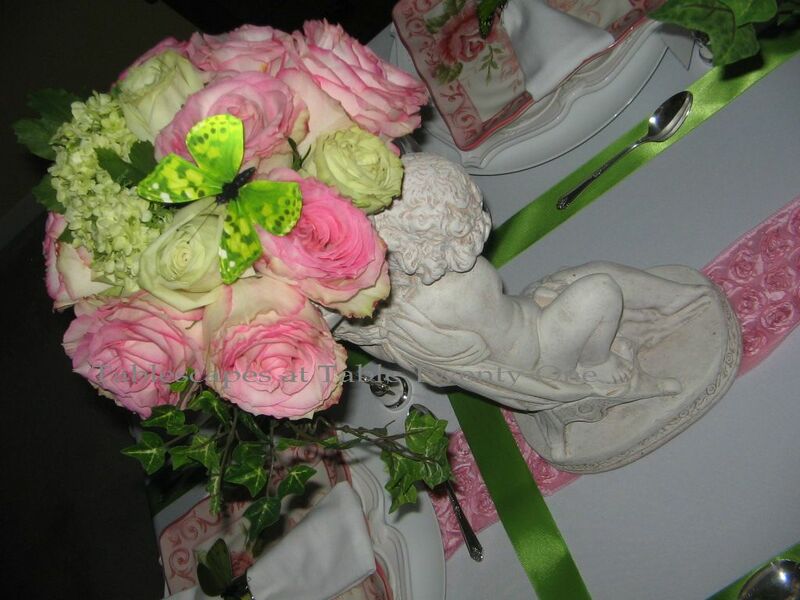 The centerpiece was made up of a series of cherub statues with this larger one in the middle. Their bowls are filled with fresh roses, orchids and hydrangea. The fresh ivy I had wasn’t long enough to add the drama I wanted, so I substituted faux strands. Although it seems quite apparent in these photos, the faux ivy was barely noticeable. I bought this fabulous rosette ribbon earlier this year. I love the texture and the look of it intertwined with satiny green. Very girly!!! I’m sure you’ll be seeing more of this in upcoming posts used in various ways! 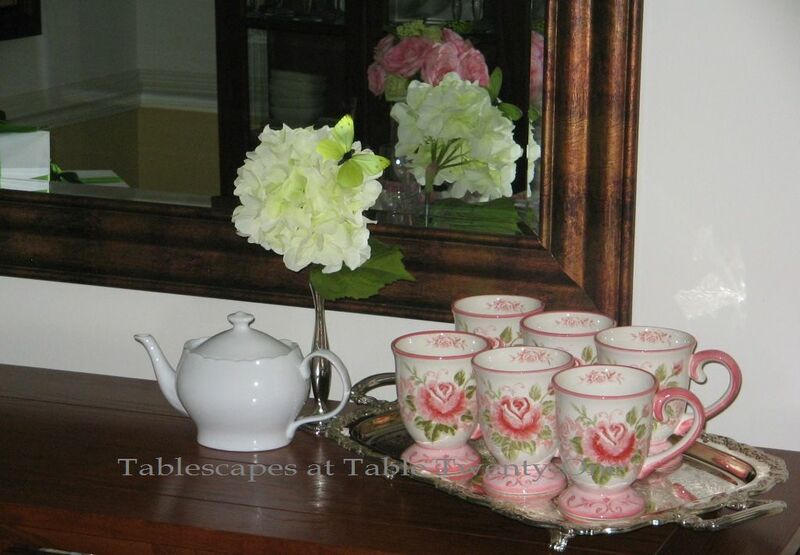 The dining room buffet served as the ideal resting place for the tea service. The buffet was also a handy spot for the gifts. 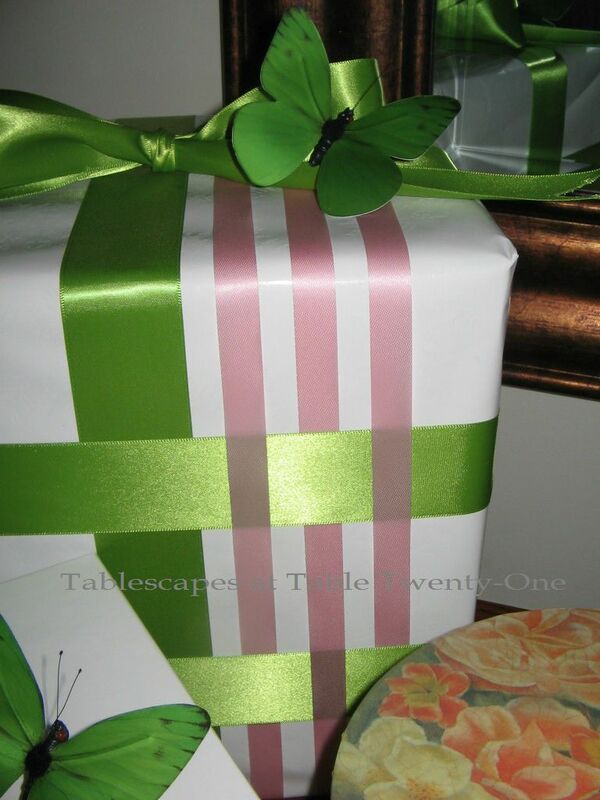 My gifts for the bride-to-be matched the table decor with pink and green ribbon over glossy white paper. A fanciful butterfly adorned each. 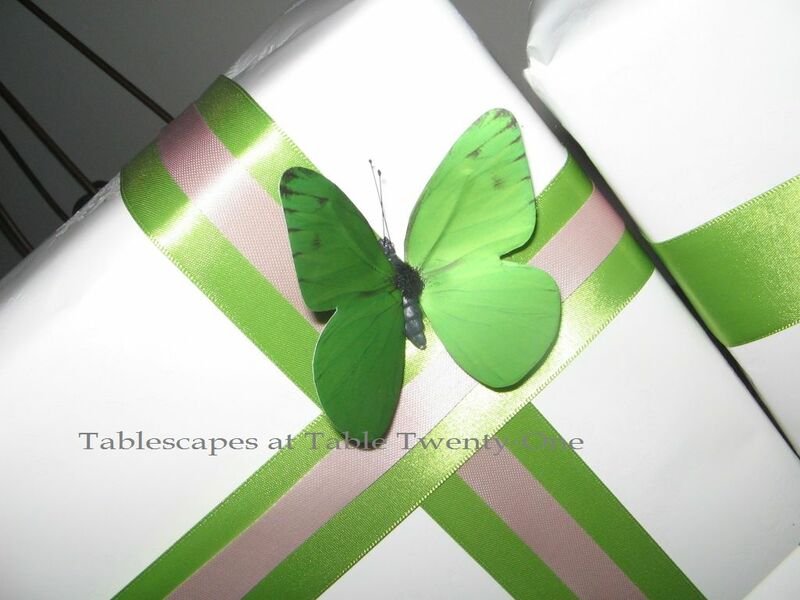 When a guest who came early to help with the food arrived without having wrapped her gift, I quickly popped on a bit of green ribbon and added a couple of butterflies so it fit right in! visit the “Wedding” tab above! Please remember to join me along with the other dishaholics at Susan’s Tablescape Thursday at Between Naps on the Porch! Thank you for crying with me on the unfortunate beheading. I should have taken a photo of him. He’s still downstairs awaiting the moving company’s assessment re: repair, so maybe I will…for old times’ sake! 🙂 I’m glad you like the crisscrossed ribbons. I’ve done something like that before years ago, although the design then was considerably more intricate using several different colors. It took forever to put together. This time, though, was a snap! Thanks for stopping in, Marlis! Gorgeous! As always. Pink & green makes me happy. Love the rose runner. Very very pretty. You know how I feel about this color combination eventho I am a Delta girl (crsimson and cream). Women of the Alpha Kappa Alpha Soroity would do wild over these arrangements, especially the one with the Ivy leaves. O….K…..having a moment, were we? 🙂 I’m taking you to the Sabates Eye Center today!!!!!!!! 🙂 Meanwhile, please make sure your AKA friends see this post! Just re-read my comments with my glasses on and discovered two mistakes in my first posted response. I do know how to spell crimson, and better sentence structure for “would go wild”. Thank goodness for eye glasses. My feeling about the beauticul tablescape remains the same. Glasses did not help for “beautiful”, however. Must be my typing. I’ll quit while I’m ahead. I’m sure the bride-to-be was thrilled with this beautiful shower table! 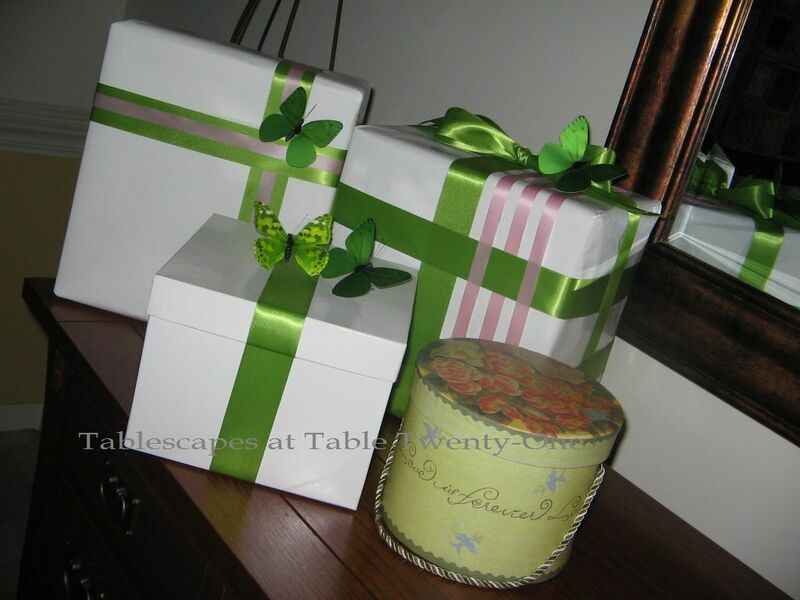 Your rose ribbon is to die for~ I love it criss crossed with the green! Your attention to detail is impeccable with those beautifully wrapped packages adorned with matching ribbon & butterfies~ I’m sure the menu was equally well thought out and as delicious as your table! So sorry about your cherub casualty~ I hope he can be repaired. 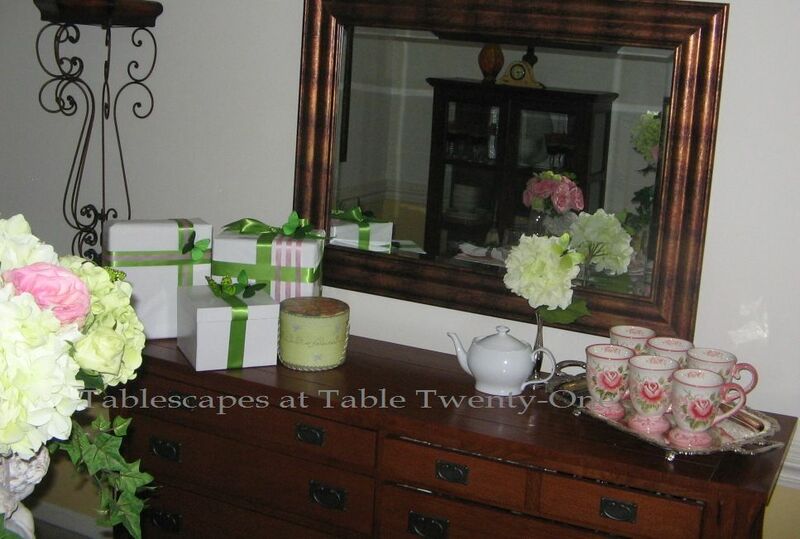 Alycia, your pink and green tablescape is so sweet and feminine, just perfect for a shower. 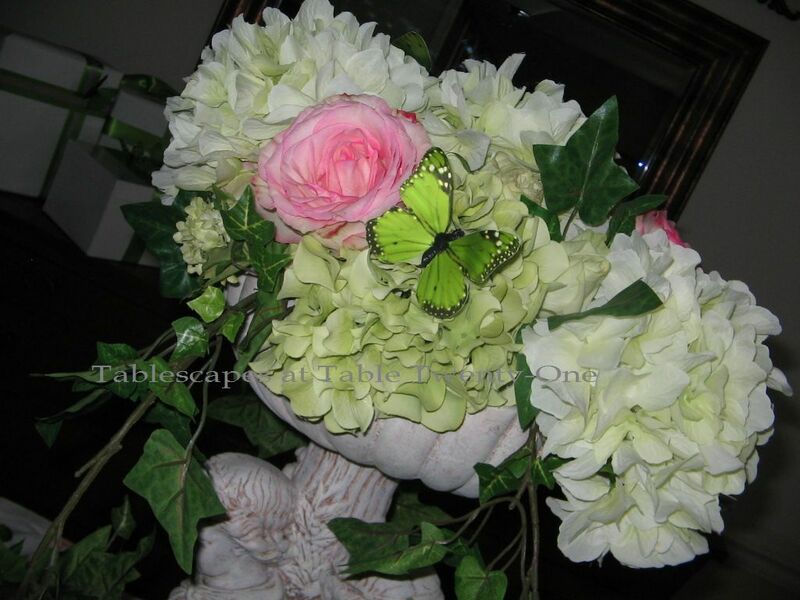 I especially like the centerpieces with the fresh roses and hydrangea. The butterflies are so cute landing here and there on the napkins and gifts. Very pretty. :). Ooooooh! You’re the best! Pink! Green! Roses! Butterflies! Ribbon! Did I say pink? What’s not to like? Thanks, Linda! This was truly over-the-top feminine, but I really liked it, too. I just can’t get enough pink! What a wonderful table. As a greena and pink lover which comes from my mom and on to me and to my daughter aswell, I adored the rosette ribbon I wish I could find some here in Istanbul and make wonders like you. Such a lovely, feminine table! I love the ribbons, and the butterflies — I know the bride was delighted! Thank you, Tricia! She was delighted! This was last summer, so I’m ready to go pink & green again sometime soon! Thank you for coming by to say hi, Cherry Kay! I’m so glad you like the table! You have a very discerning eye, so your opinion is always valued! Have a wonderful weekend! I think the ribbon on the table is a wonderful idea! Really adds to the charm!! Gosh, so sorry about the cherub statue. Those are so awesome, I hope it can be fixed. I think I have similar dishes, except mine say love, I think?? Anyway, I “love” them. And your Chelsea Godinger–you know I love it, I went out and bought all I could find in a 50-mile radius! Such a well thought-out and planned event, beautiful!! Yes…you and I are the Godinger sisters, for sure!!! 🙂 I think I only got 24 of the goblets. Wish I would have gotten more. Oh, well…!!! They are treasured. I saw the ones that said Love on them!!! I almost got them, but I already had these and I decided against it. Now I’m kind of sorry I didn’t because they would have come in handy for a lot of events. I need to stop second-guessing myself when I’m out there shopping! I’m hoping, too, that the cherub can be repaired. It’s a long shot, I think. I thought it was a clean break, but there are some chips missing. The moving company’s people will be out the 2nd week in August to assess the damage to that and the other items that were broken. I’m going to hope against hope! Thanks for stopping by. I’m glad you like the table! As a pink and green gal myself, I’m certain your guest of honor was most delighted — This is gorgeous. Love your flower tips too. So beautiful!! I love the whole “girlie” table and that green ribbon on the table is magic! I’m sure the guest of honor LOVED everything!! Hi there, Tess! When I was a single gal, the master bedroom of my condo was all pink & green. I loved it. Of course, married life changes things. I love it when I’m able to revert to those hazy, crazy days of over-the-top girly!!! Thanks for stopping in. I always love to hear from you! Beautiful table. I love all the girly frilliness! The ribbon is brilliant, I would never have thought of it. The cherub vase is the perfect touch. Thank you, Taunnie! Thanks for visiting!!!! Beautiful……..I love the pink and green colors, and the way you use the ribbon as runners. The gifts using the same ribbon on white paper are lovely. 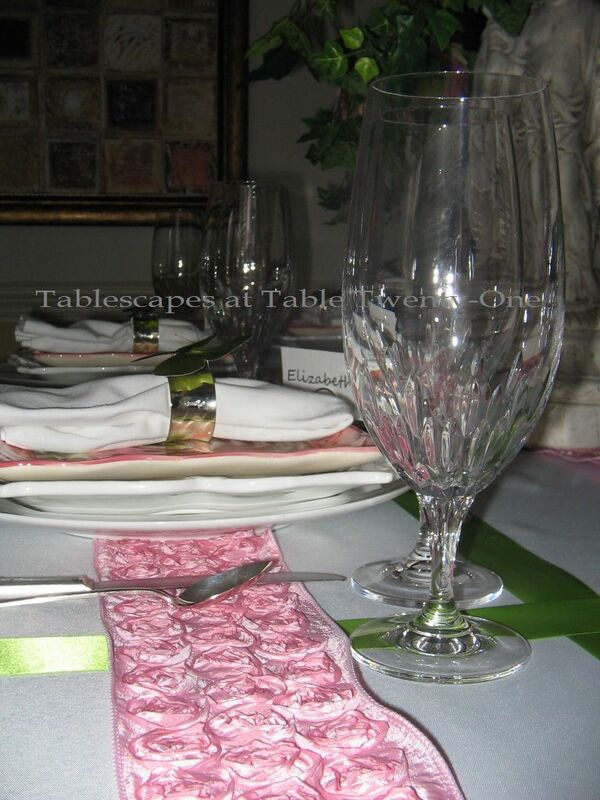 The starched white napkins are so elegant and look perfect placed on the luncheon plate. 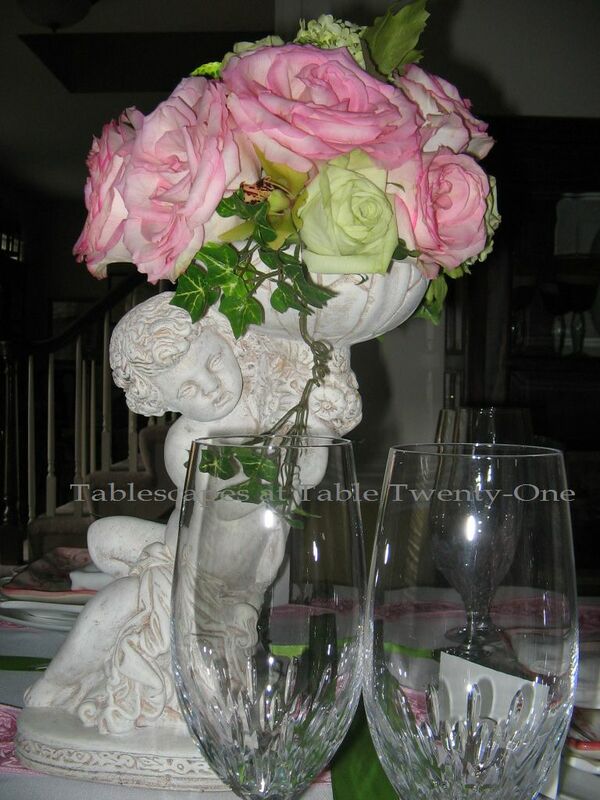 The centerpiece made up of the roses and hydrangeas are so lovely as are the cherubs statues. Hope you were able to mend the broken cherub. Thanks for sharing……….. Thank you so much for stopping by, Emily! I appreciate your sweet comments! I don’t know if they’ll be able to fix the broken cherub or not. I have a friend whose husband knows how to do that sort of thing. I’m hoping my cherub can be restored to life! 🙂 Have a great weekend, and thanks again for visiting! Oh my this is really something! I love how you wofe the ribbons on everything even the gifts! Really great job! The plates are perfecto and the cherubs too! The floral arrangements are done perfectly! I have a bridal shower I posted at beginning of June that my sisters put on for my son and his fiance. You did a great job and I’m sure everyone loved it! How good to see you here again with yet another beautiful table. One of these days I’m going to show up in your town and insist on being treated at one of your lively tables! So pretty! I am inspired to make a cake with a pink and green palate. Maybe some time next month and of course I will showcase at the cake studio. Thank you for the inspirations! Hi, sweet Michelle! I’m so glad you stopped by! I couldn’t hold a candle to anything you do in the cake studio, girl! You know you are the real deal!!! If you do a pink & green, let me know and I’ll link up! What a beautiful table. I love all the pink and green. Everything looks so special for a special occasion. Lovely. So beautiful. What a great tablescape. Love the colors. They were so blessed/lucky to have that wedding shower/party hosted by you! 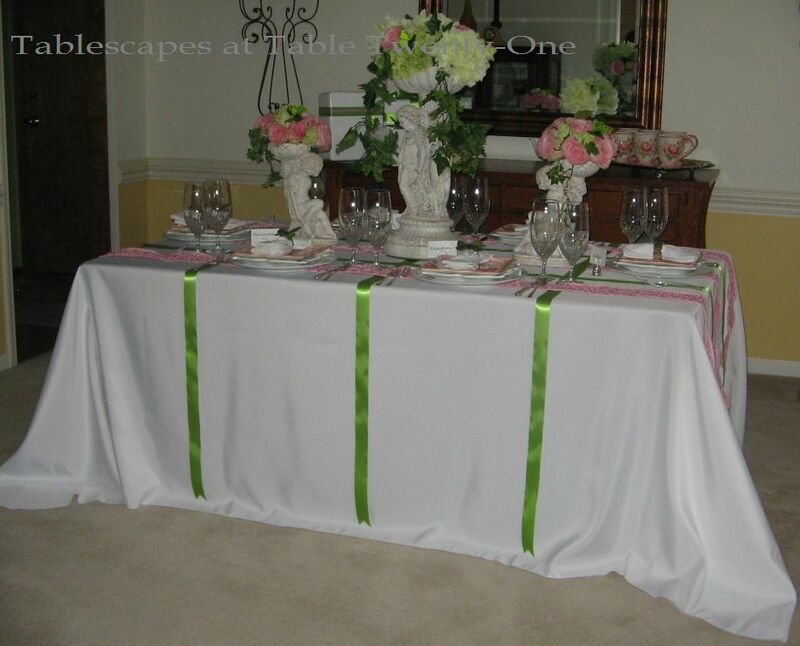 I love the pink/green combo–it was superbly done by you….love the cherub statue/floral centerpieces…..love your utilization of ribbons on the table/love the layered plates (I am in love with the square plates). Lana! Wow…you’re up early this morning!!! How do you do that?!??!?!!! 🙂 Oh, wait…maybe this is 5:05 Italy time. I never know with this thing! At any rate, thanks so much for stopping in and leaving such a wonderful comment!!! I defintely will get over to your place today. Congratulations on doing your first giveaway!!! Have fun with it! Even though I took off for a couple of months, I tried to stay plugged in to as many blogs as I could. Yours is always super interesting because you are in such a fabulous country! Have a wonderful weekend, and I will see you next week! 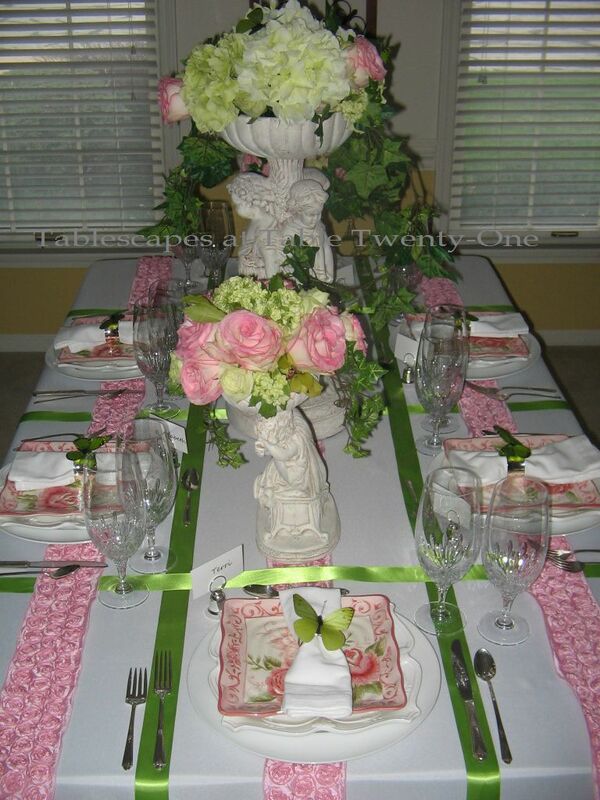 Alycia, What a beutiful bridal shower….I love the colors pink & green! The ribbon idea is great. I have never used ribbon in that way. I love the pink plates and I think I have the white fancy ones in yellow. Just beautiful! I love frillie, girlie & roses! I am sad at the cherb getting broken in your move.I I know your heart must have sank when you saw your angel broken. I have had serveral precious things broken in my move and feel bad. I think that’s what God made glue! Most times you can’t even tell! Good Luck! I love pink and green together! Wonderful … and the pink ribbon is over the top girly for sure. Love the printed square plates — beautiful. What a lovely shower! Lucky bride. Thanks for all the beautiful inspiration on your blog. Cough, cough splutter splutter…….OMG, I am speechless! (which is so rare). Your table is absolutely blooming amazing. I love every little detail on it. The colours are perfect together. i bet you had so much fun doing it all! Thank you so much for coming by my blog, and thanks for the lovely words. I am glad I was able to make you laugh. Hey there, Jo! First of all, I love the way you “talk”!!! Even your written word lilts!!! You know us silly Americans have a great affectation for an English accent! 🙂 We just can’t get enough of it! I’m so glad you stopped by this evening! Thank you for that!!! I enjoyed your blog, and I will pop over to follow. I’m not sure what time it is in New Zealand right now, but have a good day/afternoon/evening…whichever applies! I look forward to chatting more in the future! This is so beautiful, loved all your tablescapes.really beautiful! daisy crazy and little black dress are awesome. ONCE AGAIN…..ATTENTION TO DETAIL IS ABOVE AND BEYOND. What a LUCKY, LUCKY BRIDE!!!!!!! 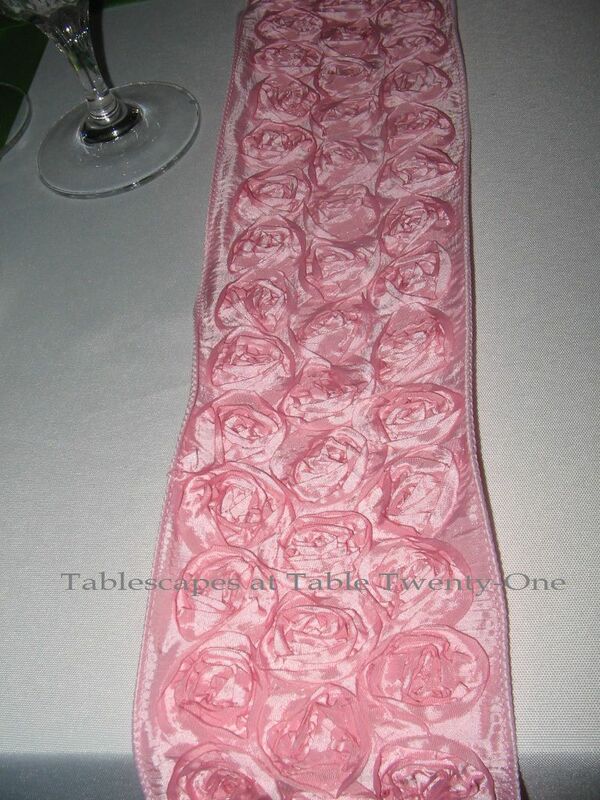 THAT PINK ROSETTE RIBBON IS STUNNING AND SETS OFF THE THEME OF THE TABLE….. PINK FOR GIRLS :^D The GREEN SATIN TOTALLY SETS OFF THE PINK!!!!!! Together they are STUNNING!!!!!! I love the ECHO of the PINK AND GREEN in the PACKAGES, FLOWERS, BUTTERFLIES, EVERYTHING IS OVER THE TOP!!!!! What a FABULOUS LOOK!!!!! I am ENCHANTED by your CHERUBS…. I will hold out hope for the best for them….. They are so ADORABLE WITH FRESH POSIES CLOSE BY!!!!!! 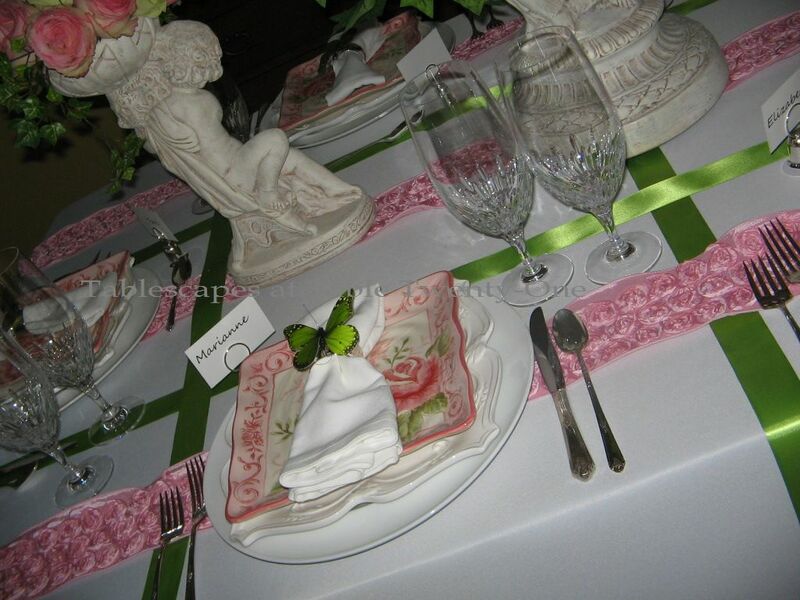 My RESERVATIONS are at TABLE TWENTY-ONE :^)……..
Love the table setting, pink, green and white are my all time favorite color combo for all things, dishes, bedrooms and of course gardens. The salad plates would be on my buy list!. Thank you so much for stopping by and checking out our garden table setting. Just beautiful! I love pink and green together too! I have some antique pink and green dessert plates I want to use in a tablescape some day. This gives me inspiration! I had the toughest time finding you after you left such a nice comment on my blog! Your profile doesn’t show on blogger so there was no way for me to contact you to respond. I saw where you had left a comment on Mary’s beautiful blog, “Home is where the boat is” & from there, I could click on your name & find you! What a GORGEOUS shower you created! I just love the pink & green combo…Delta Zeta colors, you know. 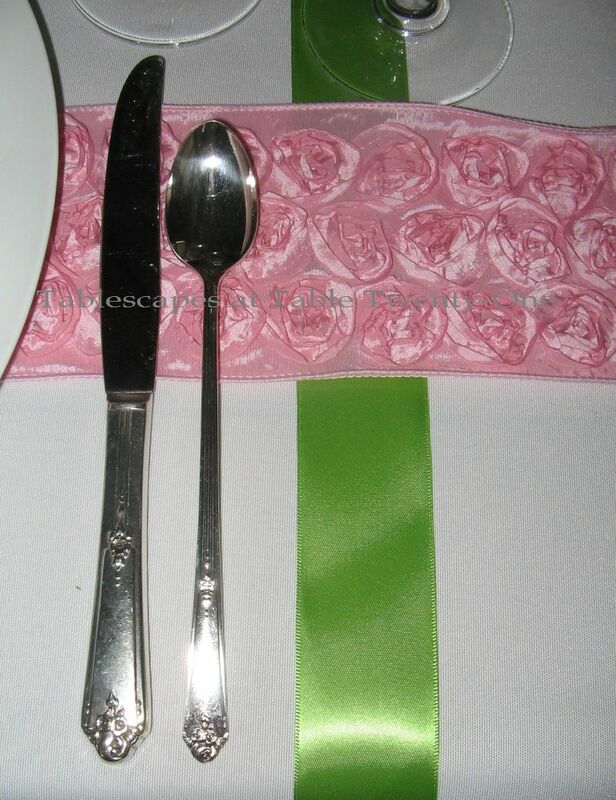 Very pretty tableware & the centerpiece is awesome along with the neat idea of sectioning off the places with ribbon. Very nice touch! I just subscribed to your blog so I won’t miss any more of your posts & will know how to find you again. Hi, Rett! I’m so sorry you had trouble tracing back to me! I’m not sure why my profile doesn’t show up on some. Maybe because I’m on WordPress? I don’t know for sure. I know that many of the blog sites I go to only give the option of commenting through a Google email account, so I’m not able to leave a URL. Hmmmm…not sure. I’ll have to look into that! Meanwhile, I’m so glad you came to visit today! I haven’t seen your subscription pop up yet, but I’ll keep an eye open. I’m never really sure how all of this works. I think I have subscribed to various sites, but then I don’t get the updates. Weird. I try to visit each and every blog each Tablescape Thursday, although I took the months of May & June off from the computer. Whoo! There is so much talent out there, and you are certainly no exception! Your tables are beautiful, AND you cook & sew like a dream…a trifecta! Thanks for tracking me down, and I look forward to seeing you each week. Take care, and have a wonderful weekend! Oh my! That is just so pretty! 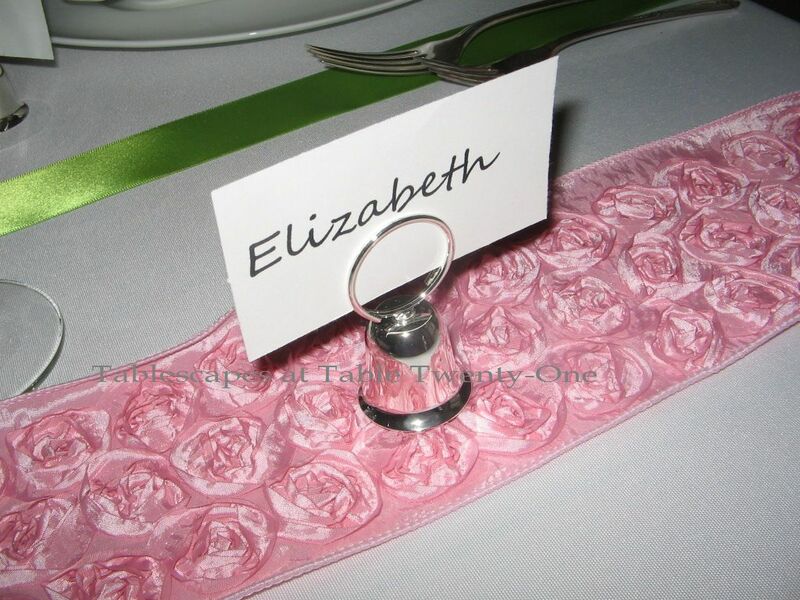 Such a great idea to layer the ribbon over the white table cloth…I may need to borrow that sometime! That you so much for your kind comments! Not only is your tablescape beautiful but very creative as well. I love all the detail, down to the smallest things, you have displayed here. Love the pink and green color combo too. Sorry about the decapitation of your cherub! I’m back…also wanted to tell you that I was reading some of the other comments and saw that one had trouble tracing back to you. I have to! I’ve tried several times and tonight is the first time I got through. I just assumed you were not a blogger because I couldn’t find anything. So glad I tried again tonight though because I love what I see! You’re so talented! Hi, Nancy! Happy Monday!!!!! I left a message on your blog as well as here. So sorry you’ve had trouble tracing me back. Not sure at all why that is. I am on WordPress rather than Blogger, so that might have something to do with it? I always leave my URL under “Select Profile” when I leave a comment. I thought that shows up on your end. Maybe not. I’ve never really looked at my site from anyone else’s computer, so I may have to do that. Please drop me a quick note to let me know if you get this and if my URL and/or email address is on there. Thanks! Have a great Monday!!! Thank you, sweet Poppy! I’m in heaven anytime I get to work with pink & green!!! One of the cherubs was recently broken, so I’m glad I had a chance to use them as a set before that happened!